The Appalachian Basin is now the most profitable place in the United States to build a petrochemical plant, according to new research from IHS Markit. And this isn’t just by a small margin – the report finds that Appalachia’s Ohio River Valley has four times the net present value compared to other regions of the country. The IHS Markit report adds to a growing body of research on the important role the Appalachian Basin will play in the future of the petrochemical industry. For instance, the American Chemistry Council’s recent report entitled “The Potential Economic Benefits of an Appalachian Petrochemical Industry” found the region could be the “second center of U.S. petrochemical and plastic resin manufacturing, similar to the Gulf Coast” and as a result could see up to 100,000 permanent new jobs by 2025. 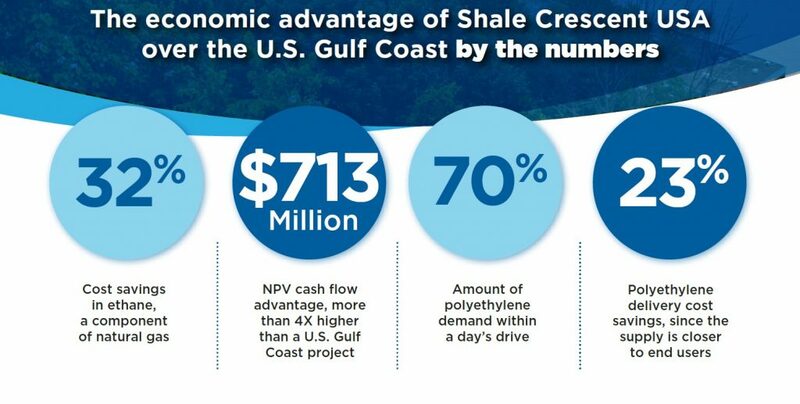 Shale Crescent USA, an economic development initiative to encourage business growth in the Ohio River Valley, commissioned this new report, which makes the business case for investing in Ohio, Pennsylvania, and West Virginia. Why is the Appalachian Basin so appealing? A bipartisan group of elected officials from Ohio, West Virginia, and Pennsylvania has also been aggressively pushing for more investment in the Appalachian region, and this week economic development groups from the tri-state area are headed to the World Petrochemical Conference to lobby for their shot at the next major petrochemical plant investment.